The average Pikachu weighs 13.2 pounds (6 kg). Ash is (still) ten years old (70 pounds or 32 kg on average). A Loyal Animal Companion who rides on its human companion's shoulder. Though it can hitch a ride on its human companion's head or even in their arms from time to time, its most prominent location is the human's shoulder. Both Pirate Parrot and Shoulder-Sized Dragon are found in this position. In Real Life this can be somewhat dangerous with larger parrots, since they like to nibble things and it tends to put their beak at eye-level. With trained birds of prey such as hawks and falcons, it is borderline suicidal — Go for the Eye is a natural predator instinct that cannot be wholly suppressed. Hunting birds are always held away from the face or perched on a staff or pole. Compare Head Pet, Feather Boa Constrictor. For (tiny) people being carried this way, see Shoulder Teammate. Hopefully has nothing to do with the position of a dead Norwegian Blue parrot. 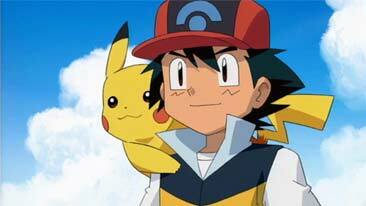 Pikachu often rides on Ash's shoulder. However, he's heavy enough to tip him over, which may have been lampshaded once when it takes James a bit to get used to the sudden weight of the amnesiac electric mouse. Similarly, Iris's Axew pops out from her hair to form this appearance on her shoulder. And despite being smaller than Ash, Axew weighs three times as much as Pikachu. Lillie usually carries her Alolan Vulpix, nicknamed Snowy, around in her arms. Boota; whenever he isn't in Yoko's cleavage, he's on Simon's shoulder. The prequel video depicts General Guame The Immovable doing the same thing with Lordgenome. Obviously this is before he partially evolved. In 07-Ghost, a dragon-like creature rides on Teito Klein's shoulder. As part of her part as an evil witch in the Non-Indicative First Episode of The Melancholy of Haruhi Suzumiya, Nagato gets a shoulder-mounted cat. It tends to slide off, so she has to keep pushing it back up throughout the episode. Kyon's sister has the cat on her head in the opening sequence. Luna and Artemis from Sailor Moon. Luna once passed herself off as a fur stole. ×××HOLiC: After much experimentation (including up Watanuki's shirt, and probably once or twice in his pants), Mugetsu appears to have found his(?) niche as a shoulder pet. Moyashimon has a weird example: Tadayasu Sawaki is often seen with an anthropomorphic spore of Aspergillus oryzae sitting either on his shoulder or on his head. It's often seen chatting up other microorganisms, or making comments on the craziness in Sawaki's life (even though Sawaki and the audience are the only people who can see or hear it). In the Tokkô manga, Kureha's pet phantom can be seen sitting on her shoulder in one panel. In Digimon Savers, Kudamon adopts a Feather Boa Constrictor position around Sampson/Satsuma's shoulders. Then you learn who Kudamon really is about 2/3 of the way through the series and it almost becomes a "Funny Aneurysm" Moment — sitting around this guy's shoulder is someone who was in a position to doom the world, if he'd sided with those who'd really sent him. Often, it's the human partners who take this position on the Mons when they're in their giant combat forms. Of course, they (generally) have the good sense to stay out of the direct line of fire. Dragon Ball: Dr. Briefs often has a black cat clinging to his shoulder. Its name is Tama ("Scratch" in the dub), and its only real purpose is to hover around him and at one point prove Android 16 isn't all that bad. In K, Neko (in kitty form) sits on Shiro's shoulder like this. To take the cuteness Up to Eleven, they tend to do things in unison (e.g. hand/tail waving, blinking). Shippou the young Kitsune from InuYasha will usually ride on one of his companion's shoulders during their travels. More often than not, Kagome is the one to carry him around. In Magical Girl Lyrical Nanoha, Yuuno Scrya often perches on Nanoha's shoulder like this when in ferret form. He only really does this in the first season as he spends less time in that form in the second season and then gets Demoted to Extra in the subsequent season. Munchkin has the Cute Shoulder Dragon, which is Exactly What It Says on the Tin: a cute little dragon that sits on your shoulder and gives a higher bonus to women than to men (is Dragons Like Women a trope yet?). The Amazon Aella has a falcon that is most often found perched on her shoulder. Wonder Woman (1987): Natasha's space lizard/tiny dragon Yuri hangs out on her shoulder at times. In Harry Potter and the Methods of Rationality, Dumbledore frequently carries Fawkes The Phoenix on his shoulder. Once, he has both Fawkes and his Phoenix Patronus on his shoulders. Then, at one time Fawkes gets especially upset at Dumbledore, the phoenix spends an entire evening riding on Harry Potter's shoulder. It is later discussed whether having a phoenix on your shoulder is a sign you're a "good" person or not. Sleeping Beauty: Maleficent's raven (later Ret-Named "Diablo") takes this spot. Tangled: Pascal is usually seen riding on Rapunzel's shoulder, or failing that, her head. Jack the monkey in Pirates of the Caribbean: The Curse of the Black Pearl tends to settle himself on Barbossa's shoulder. In The Abyss, Hippy's rat is often in this position. Prehysteria featured a miniature Pteranodon that liked to perch on a girl's shoulder. In one scene, said girl even calls her to perch on her finger like a trained parakeet. Many of the smaller daemons in The Golden Compass are seen riding around on their companions' shoulders. In A Girl Named Sooner, Sooner's pet bird rides contentedly on her shoulder. In The Crow, the crow can sometimes be seen perched on Eric's shoulder. Who Framed Roger Rabbit: In a case of What Could Have Been, Judge Doom was going to have a Toon vulture perched on his shoulder. Interestingly, a licensed toy set included him with Doom. Ladies They Talk About: The matron of the jail has an actual parrot on her shoulder. She even uses it intimidate a prisoner. Pokémon Detective Pikachu: Defied when Detective Pikachu tries riding on Tim's shoulder, but Tim puts him down, which results in Pikachu being snarky about it. Pikachu: Fine, I'll walk. I'll try to get in a hundred thousand steps this hour. Captain Flint, Long John Silver's parrot in Treasure Island, may be the ur-example. The Sword in the Stone: Merlin's pet owl, who is very stuck up, can be shut up by lowering your hand he's perched on, forcing him to run up your arm to your shoulder, thus demonstrating to him that he is only a bird and thus subject to a bird's instincts. In Guards! Guards!, Lady Sybil Ramkin is seen training swamp dragons to sit on one's shoulder, as shoulder-sitters are in fashion. However, the would-be fashionistas often don't consider the consequences of having a volatile creature on your shoulder, as Sybil details: "... next thing you know, you've got crap all down your back and a singed hairstyle." Dragonriders of Pern: Beauty, Menolly's queen fire lizard, reserves this position exclusively for herself. Corinna Chapman mysteries : Lucifer, a smallish but very active and bold kitten, litter-mate to "Fluffy" Tori and dignified Nox, often rides on the shoulder of Trudy the gardener. Trudy greatly admires his rather slapstick enterprise. He is often described as looking as if he has eaten a parrot and taken its place. Faithful, the black cat in Song of the Lioness, likes to be on Alanna's shoulder. While he's happy being picked up by her friends, he won't go on their shoulders. In The Chronicles of Narnia, Reepicheep occasionally rides on someone's shoulder. However, he does not appreciate being mistaken for a pet. The titular feline Bond Creatures of the Ghatti's Tale series sometimes do this, although having a 40 pound creature in such a position does seem a bit of a stretch. In fact, they're TRAINED to assume this position, should they need to get out of the way quickly. Diogenes Club: In "Swellhead", Stacy arrives at Richard's house to call him out of retirement and finds him walking around with a Siamese cat perched on his shoulder (and a Persian kitten peeking out of his coat pocket). In an episode of The Bill, the police speak to a local resident who happens to have a cat on his shoulder. None of the characters act as though this is unusual, and the man never appears again. Game of Thrones: The dragons do this in Season 2, before they grow substantially. Polly, Long John Silver's lobster (parodying the parrot of the original) in Muppet Treasure Island. The Traveller Adventure, section "Pysadian Escapade". It's mentioned that the alien anolas can ride on the PCs' shoulders. The Complete Ranger's Handbook specifically averts this trope in its Falconry section, pointing out that hunting birds are never carried on the shoulder. As their natural instinct is to take out an ear or eye blinding-fast, even the most well-trained falcon cannot be trusted so close to the face. Thus, seeing any bird of prey riding on someone's shoulder is a sure sign that it isn't a natural animal, but more likely some sort of magical beast or familiar. Pseudo-dragons are described in several editions of the game as being fond of this trope, when bonded with a humanoid companion. The pirate themed Maneater model from Warhammer and Warhammer: Age of Sigmar has a pet Gnoblar/Grot wearing a parrot costume sitting on his shoulder in place of a Pirate Parrot. In the Disney Theme Parks exclusive movie Captain EO, whenever he's not flying, Fuzzball is seen sitting on the shoulder of the eponymous Captain (Michael Jackson). The eponymous Daxter from the Jak and Daxter games has this as his default position. Jak's shoulder, while probably made of iron itself (Daxter weighs 48 lbs/22 kg and Jak literally does everything with him there), most likely gets saved from being shredded by his claws thanks to his single shoulder pad. In Puzzle Pirates, the player can get a "familiar" pet that perches on the player character's shoulder. Originally they were all parrots or monkeys, but later updates to the game have added octopuses and seahorses (which nonetheless like a shoulder perch) and serpents (which go the Feather Boa Constrictor route). The Medic can equip his pet dove Archimedes like this, for the low, low price of $12.99! It even mirrors his facial expressions. Also, if he's on RED team, it's covered in blood. Cute, huh? The other classes eventually all got their own shoulder pets, with Chucklenuts the squirrel , an eagle for the Soldier, a Halloween-restricted dead bird for the ever-creepy Pyro, an actual parrot for the Demoman, a tiny robin for the Heavy, Ein the canary, Sniper gets three with the Cobber Chameleon and Steel Songbird and Sir Hootsalot, and Spy gets his own Spycrab and possibly a snake as well . The snake is debatable, as it wraps around his arm, though its head rests on his shoulder. And that's not even counting the pocket pets. What with them being in pockets and not on shoulders. Phoenix Wright: Ace Attorney  Dual Destinies introduces prosecutor Simon Blackquill, whose pet hawk Taka likes to sit on his shoulder when not fetching pieces of evidence or harassing the defense attorney. In ARK: Survival Evolved, the smallest critters, such as monkeys and Dimorphodons, can be carried on the player's shoulder after taming them. In Lunar: The Silver Star, Nall is frequently seen on Alex's shoulder, same with Ruby and Hiro in Lunar: Eternal Blue. After obtaining the familiar version of Midgarsormr in Final Fantasy XIV, he will perch on your shoulder from time to time. DSBT InsaniT: Chilly the chinchilla is almost always on Autumn's shoulders. Blackwing, Vaarsuvius' raven familiar from The Order of the Stick, has started riding of V's shoulder once the wizard started acknowledging the bird's existence consistently. This can sometimes look weird, since stick figures in this comic have heads bigger than their shoulders are wide. Bun-Bun and Kiki of Sluggy Freelance regularly rides some shoulders. Kiki is just a cute Weasel Mascot, but for Bun-Bun... it isn't like anybody would dare saying "no" to the little bunny psychopath. Discussed, but never actually done, in Freefall. When contemplating piracy, Helix says that they need to include Florence, because she's the only one with shoulders for the parrot to ride on. Later, Helix gets an emu, which he believes will command more respect. Sam agrees, "I know I'd be respectful of a pirate with an emu on his shoulder." Note that they plan to be space pirates, and there's no artificial gravity, so this might be less intimidating than intended. In Godslave, this is Anpu's favourite method of travelling, in contrast to being picked up. In Bugged Run, Elle and Viral routinely ride around on various parts of Chrys's body as Caterpie and Weedle, most usually her shoulders. Viral even gets to ride around like a living backpack after evolving to Kakuna. Both Iago the parrot and Abu the monkey in Aladdin: The Series. The illustration on the cover of Treasure Island that Bart was supposed to read for a book report, but didn't. Bart: Fellow students, prepare to be dazzled! (walks to the front of the room) Well, as Mrs. Krabappel already mentioned, the name of the book that I read was Treasure Island. It's about these... (describing the book jacket) pirates. Pirates... with patches over their eyes... and... shiny gold teeth... and green birds on their shoulders... (pause) Did I mention this book was written by a guy named Robert Louis Stevenson? And published by the good people at McGraw Hill. So, in conclusion, on the Simpson scale of one to ten, ten being the highest, one being the lowest, and five being average, I give this book... a nine. Any questions? (hands go up) Nope? Then I'll just sit down. Played With in the episode "Simpson Safari", where they take a trip to Africa and meet their guide, Kitenge who first appears with a bush baby on his shoulder. Lisa comments on it being cute. Cue Kitenge being surprised it's there and shooing it away. Momo the lemur-bat rides on Aang's shoulder a lot. Then there's also the pirates from "The Waterbending Scroll", one of whom has a "reptile bird" instead of a parrot. In The Legend of Korra, Pabu tends to wrap himself around the shoulders of whoever he's most attached to at the moment. Usually it's Bolin, but occasionally the other members of the new Team Avatar. In Perfect Hair Forever, Young Man's parrot must be lazy, as it doesn't so much ride than sit on his shoulder. Jana of the Jungle: Jana sometimes has Tiko sitting on her shoulder. In the Timon & Pumbaa episode "Two for the Zoo", when the animals get freed from their cages and confront Timon and Pumbaa, the buzzard is sitting on the gorilla's shoulder similar to a pirate's parrot. Traditionally, the African basenji dog is carried over rough terrain by laying it across its owner's shoulders, with its legs extending forward like a canine Feather Boa Constrictor. Shoulder-riding is a favorite activity of many pet rats, as they like the feel of being high up, yet still sheltered by their owner's neck and hair. Chinchillas and hamsters are a few other rodents known to do this. Ferrets when held will instinctively try to climb up onto your shoulder. Many pet birds like to do this, if they're not on their human's head. That said, falconers are trained to keep their birds away from the face unless they really really want an eyepatch. Many owners of tamed/domesticated foxes have posted pictures of them standing on their shoulders.